Elena Fowler holds up the trophy while celebrating a first place finish for Holy Names Academy in the team competition during the 2A/3A Washington gymnastics state meet on Thursday, February 16, 2017, at the Tacoma Dome Exhibition Hall in Tacoma. A historic season including a 13-game win streak and packed gyms for home basketball games didn't distract House in the classroom. The Washington Interscholastic Activities Association (WIAA) released its winter team academic state champions. The list is separated by sport or activity per classification, averaging the team’s compiled grade point average (GPA) to comprise the winner. Holy Names’ gymnastics squad had a 3.866 GPA to win the Class 3A academic championship in their sport. 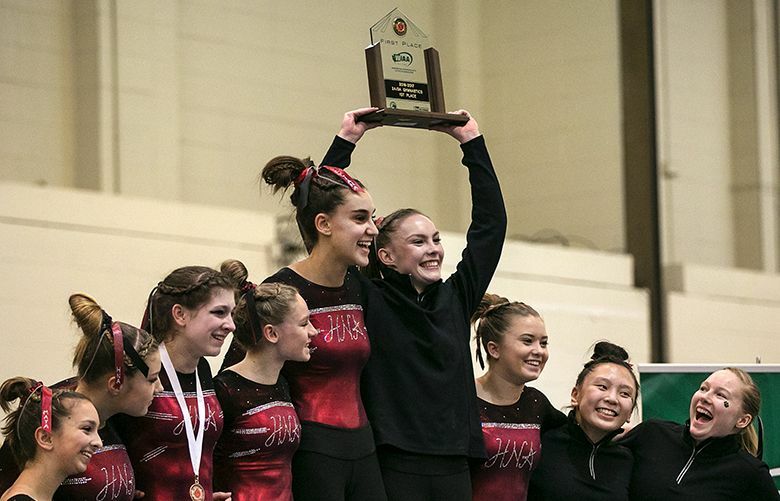 The Cougars, who have 10 competitors, also won the school’s first Class 3A state gymnastics title in February. For the boys, The Northwest School clinched its first state berth in boys basketball this season as winners of the Emerald City League title. It also won the Class 1A academic championship in the sport with a GPA of 3.843 for the team of 11 players. Skyline took home the Class 4A boys basketball academic title. The 12-player Spartans roster held a 3.7 GPA through a 13-8 season. Kamiak’s 19-member wrestling team carried a 3.405 GPA through its season to clinch the Class 4A academic title.